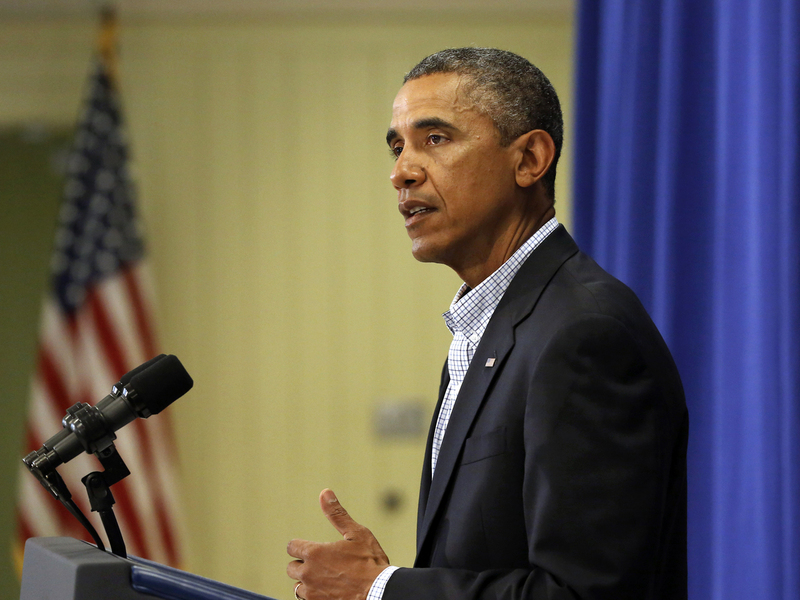 Obama Urges Healing, Peace In Ferguson, Mo. : The Two-Way The president said the Department of Justice is investigating the fatal police shooting of an unarmed black teen in the city but that there's no excuse for violence against the police. President Obama speaks to reporters Thursday about the police shooting of 18-year-old Michael Brown in Ferguson, Mo. President Obama is calling the situation in Ferguson, Mo., where violence has broken out in the aftermath of a police shooting of an unarmed black teenager, "heartbreaking and tragic." Speaking in Edgartown, Mass., on Martha's Vineyard where he is vacationing, Obama said he received a briefing this morning from Attorney General Eric Holder. "I've already tasked the Department of Justice and the FBI to independently investigate the death of Michael Brown," he said, referring to the teenager police fatally shot on Saturday. "I made clear to the attorney general that we should do what is necessary to help determine exactly what happened and to see that justice is done." As The Two-Way's Bill Chappell reported earlier Thursday, police in Ferguson have used helicopters, armored vehicles and the threat of arrests in an effort to control the area that's been torn by racial tension and outrage over the shooting. "I know emotions are raw right now in Ferguson, and there are certainly passionate differences about what has happened," Obama said. "But let's remember that we're all part of one American family. We are united in common values and that includes the belief in equality under the law, respect for public order and the right to peaceful public protests." The president said that regardless of the circumstances of Brown's death, there is no excuse for the police to use excessive force and there is "never an excuse for violence against police, nor for anyone to use this as a cover for vandalizing or looting. "Now is the time of healing. Now is the time for peace and calm on the streets of Ferguson," he said. The president said he'd spoken to Missouri Gov. Jay Nixon, "a good man and a fine governor." Just before Obama's remarks in Massachusetts, Nixon addressed a crowd in Missouri, saying it was important to make sure that justice prevails. "I'm confident that, working together, he is going to be able to communicate his desire to make sure that justice is done and his desire to make sure than public safety is maintained in an appropriate way." Nixon promised unspecified "operational shifts" for law enforcement in Ferguson, saying, "You all will see a different tone."